In Mai and June are the elections at our FAU. Students, employees, professors and doctoral candidates elect their representatives. Since we are your current elected doctoral candidates’ representatives, we wish to answer all your questions about how our universities democracy works and how we all can participate. An overview about us is given here. For detailed information about our tasks, projects, committees, commissions, etc. 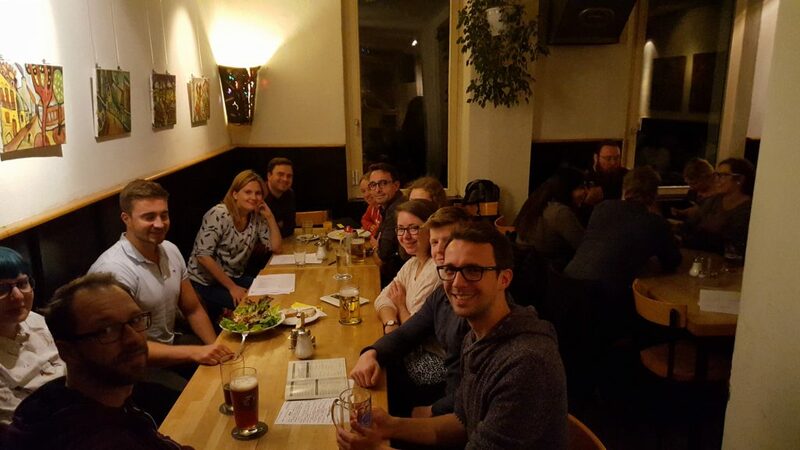 contact us via mail or ask us directly at our Get Together in the pub Pleitegeier (Hauptstraße 100, 91054 Erlangen), starting at 7 p.m. We are looking forward to discuss with you about your life at FAU in order to contribute to a supporting and pleasant environment for your reasearch. We warmly invite you to a get-together evening of all graduate students of the FAU on Thursday, 28th of March 07:00 PM in the pub Palais Schaumburg (Kernstr. 46, 90429 Nürnberg). We hope to see you there! No registration needed. If you have any questions about the event or your doctorate, we are looking forward to help you. The next get-together with information about the upcoming university elections and how you can become part of the next doctoral candidates’ representatives (see also About Us) is planned for April 30 in Erlangen. Save the date! We warmly invite you to a Get Together evening of all graduate students of the FAU on Monday, 11th of February 07:30 PM in the pub StarClub (Stubenlohstraße 25, 91052 Erlangen). It’s a good opportunity to meet fellow doctoral candidates from other disciplines and most importantly spend a wonderful evening. No registration needed. If you have any questions concerning the Get Together or about your doctoral process in general, we are looking forward to help you. In case you have ideas or wishes for additional PhD Get Togethers we are looking forward to hear from you or just drop an e-mail directly with helena.muster@fau.de. 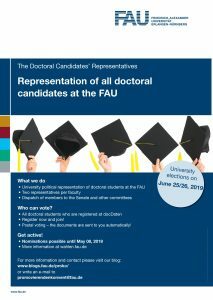 Doctoral Candidates at the FAU can enrol as students. This costs semester fees of 116 Euros, but we benefit from discounts in the universities canteens or the Semesterticket, for instance. More information about how to enrol, can be found here. The re-registration starts on 1. of February, so don’t forget to transfer this sum in time, if you want to stay enrolled. Usually the enrolment for doctoral candidates is limited to 6 terms. However, if there any problems or if you reach the 6 semester limit, free to contact us – we will help you. – How to cite your own papers in your thesis: What is the current situation and what solution should we pursue? – Cumulative Theses: Not permitted at our faculty yet, but it is worthwhile? – Industry financed „scholarships“ instead of employments: Is it a problem at the Faculty of Engineering? – The formal regulations for your thesis & defense? We are looking forward to a vivid discussion. No registration needed. If you have any questions and suggestions, please contact us! We also talked about upcoming and planned social events. There will be a Get Together (Kneipenabend) on the night of the Kick-Off Event for the Academic Year 2018/19 (Auftaktveranstaltung für Promovierende) directly after the event. We will soon inform you about the time and place. We will also consider other events in the near future like a group hike, brewery visit or guided city tour. If you have any thoughts and suggestions on this (or any other topic) we are happy to hear from you! Brown Bag Break – Tue, 13 Nov 2018, 5 p.m.
It’s time for another Brown Bag Break at FAU! A great opportunity for networking beyond your current research project, to get in touch with young researchers from other disciplines and to share ideas. This time it is once more up to the Faculty of Sciences to host the event. The key part will be a presentation by DAAD Visiting Professor Francisco Zaragoza (Chair for Economy, Discrete Optimization, Mathematics) about his career in Science: „There is no Shorter Path – An Academic Career in Optimization”. In addition, Referat F2 will quickly introduce us to FAU’S new Digital Tech Academy. All presentations will be given in English. … and for the good discussions! It was a great evening! We would like to invite you to a Get Together of all graduate students on Tuesday, 2nd of October, starting from 19:30 in the bar Palais Schaumburg (Kernstraße 46, 90429 Nürnberg, near S-Bahn station Rothenburgerstraße). It’s the perfect opportunity to meet your fellow doctoral candidates from other disciplines and spend a wonderful evening. No registration needed.